Common trade names include alloy 625, nickel alloy 625 and UNS N06625. INCONEL®, the nickel-chromium alloy is a trade mark of Special Metals Corporation. Inconel 625 is an impressive alloy that is best known for high strength and aqueous corrosion resistance. This nickel alloy has great weldability; its toughness makes it a great choice for many different industries. Other high levels of resistance include chloride pitting and crevice corrosion cracking. It proves resistant to seawater in both flowing and stagnant conditions and is immune to chloride ion stress corrosion cracking. 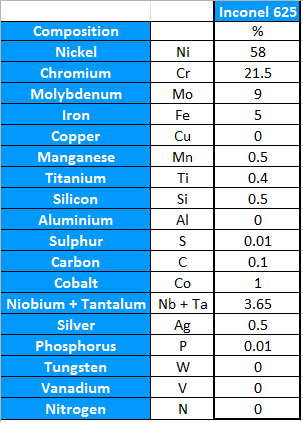 (See below) This table shows the durability of Inconel 625’s aqueous corrosion resistance in comparison to our standard material of stainless steel 316. Do Not Use: This section is present to show that use of this material within the listed environment is not recommended. Inconel 625 is one of seven corrosion-resistant alloys in our special metals range. Other properties of alloy 625 include high creep-rupture strength and its addition of niobium. Niobium acts with molybdenum content to stiffen the alloys matrix. Inconel 625 is widely known as a fantastic choice of metal for marine applications, due to the high resistance to seawater it possesses. In fact, 625 is widely used for oceanographic instrumentation and submarine propulsion motors. Low and high pressure compression fittings are available in Inconel 625. Our tube and pipe fittings in Inconel are great for the marine and chemical industries. Standard sizes for Inconel 625 tube fittings are up to 1” or 25mm tube OD sizes. We also accept enquiries on large-quantity orders for bespoke fittings in alloy 625. 3 metres is our most popular tube length. 625 tubing can be provided with orders for 625 fittings in both the single and double ferrule ranges. We ask that all purchasers consider the Health and Safety requirements for the intended use. Temperature, pressure and hazardous media should be vital factors in selecting the correct material, fitting and valve. We advise strongly not to interchange pipeline components due to risks of application failure. Inconel 625 tube fittings are not interchangeable with other compression fittings in the same material. Waverley Brownall fittings are marked with a cast code and in some cases, a logo or name. The interchanging of compression fittings, branded or non-branded, could cause extensive damages and fatal accidents. Pipe and Tube; ASTM B 444/B 829 & ASME SB 444/SB 829 (Seamless Pipe & Tube), ASTM B704/B 751 & ASME SB 704/SB 751 (Welded Tube), ASTM B705/B 775 & ASME SB 705/SB 775 (Welded Pipe), ISO 6207 (Tube), SAE/AMS 5581 (Seamless & Welded Tube), VdTÜV 499 (Tube), BS 3074NA21 (Seamless Pipe & Tube), DIN 17751 (Tube), ASME Code Case 1935. Other specifications exist for plate, sheet and strip. Rod, bar, wire and other product forms.